While I never understood why the Social Principles were so disorganized, scattered, and repetitive, I accepted that this is the result of our piecemeal legislative process. 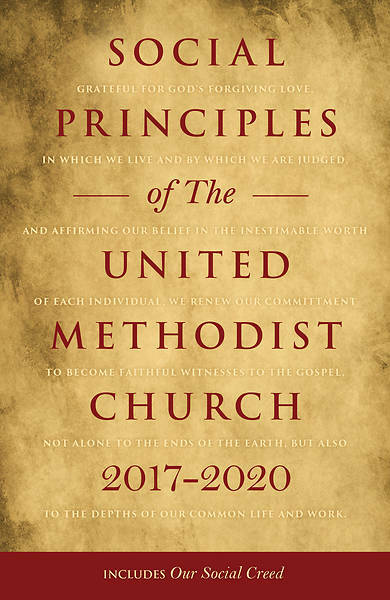 I therefore expected that the proposed revision of the Social Principles, with its goal of becoming more succinct, globally relevant, and theologically grounded, would bring order to the chaos. Unfortunately, the proposed revision has made the scattered repetition even worse. The effect of both points is that we repeatedly have statements on similar issues in two places rather than just one. And there are no cross-references between the two. Worse still, sometimes one statement is theologically grounded (the third stated goal of the revision) while the other one doesn’t mention God or faith at all. Combining and abridging the statements would help to ensure that every paragraph is grounded in God. So, why is there so much repetition? Why are these sections divided? It’s simple: the underlying structure of the Social Principles was set up by U.S. white males in 1972. This was prior to second-wave feminism and postcolonialism. Granted, these two social movements were underway — but that did not mean that the Church was listening to them. Even today the Church does not take seriously the voices of women, people of color, and people outside of the U.S. The initial Social Principles Study Commission, established in 1968, did include women, notably “Mrs. Ted F. Baun” as secretary. They invited people such as “Mrs. Sarah B. Adam, Commission on Social Concerns, Monrovia, West Africa” to author papers. You can read their 1970 report here. But these moves toward inclusion did not change the dominant U.S. white male perspective. The effect was that we siloed women’s issues and global concerns. The social, political, and economic communities were the domain of U.S. men. By the time I began debating with my high school boyfriend, that the personal is political (and its corollary: the personal is theological) had been explored in detail by womanist theologians, mujerista theologians, and feminist theologians. Boundaries were falling between “personal” and “public.” This showed in our Social Principles as topics began to be repeated in multiple sections. Gender norms, sexual exploitation, health and (dis)ability, and aging cannot be separated into discrete categories of “this is nurturing and this is social.” They are intrinsically tied! We cannot arbitrarily divide “The Nurturing Community” from “The Social Community.” These two sections need to be combined. My concern about “The World Community” is similar. If we carry a global perspective throughout the Social Principles, we should not need to label a handful of categories as specifically “global.” When we name some sub-sections as “Global Health” or “Global Communication,” it implies that the previous sections on health and communication were not adequately global in scope. If so, we need to revise the previous sections to make them global. Truly global perspectives throughout the Social Principles should make it irrelevant to separate one section out as The World Community. Fortunately, we now see this redundancy! In the revised Social Principles, there is substantial overlap between “The World Community” and “The Political Community.” Our revision is beginning to recognize that each country’s political community affects (and is affected by) the world community. Now we need to update our structure to better serve the improved content. This proposed restructure would substantially reduce the total number of sections — at which point it will be much easier to edit them even more succinctly. We won’t try to say the same thing over and over again in different places due to arbitrary category divisions. We won’t be tempted to pretend that what happens in one nation doesn’t affect the world (and vice versa). We won’t silo some issues off as affecting “the world” or “nurturing”; instead, our very structure will recognize that world concerns and at-home concerns are intricately connected with the environment, politics, and economics. Combining paragraphs will also make the Social Principles more user-friendly. For example, our statements on gender would not be divided into “Gender Equality,” “Marriage & Divorce” and “Reproductive Health” in The Nurturing Community and “Rights of Women & Girls” and “Rights of Men & Boys” in The Social Community. I’m interested in your own thoughts and reflections on this revision. But more importantly, I know that the General Board of Church and Society is interested in your feedback. So if you agree with me or not, go read the proposal and comment there!